A woman delivering a Chinese takewaway was robbed at knifepoint near Kettering. Shortly before 9pm on Saturday, December 1, the victim was in Gainsborough Avenue, Barton Seagrave, when she was asked for a lighter by two men. One then grabbed her by the hair and threatened to use a knife if she did not hand over money. She handed over cash and the men left the scene. Both the suspects are described as white, aged around 18, 5ft 7in and of slim build. One wore a dark blue hoody with dark bottoms, the other a grey or beige hoody with light coloured bottoms. Anyone who saw anything in the area at the time of the offence, or who recognises the description of the suspects, is asked to call police on 101 or Crimestoppers anonymously on 0800 555111. Last month two drivers delivering pizzas were robbed at knifepoint in similar circumstances on the Grange estate in Kettering. 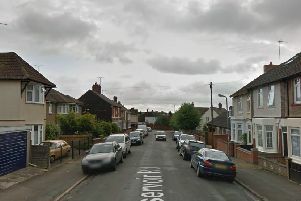 This newspaper has asked Northamptonshire Police whether they are linking those incidents to the Gainsborough Avenue robbery but the force is yet to confirm if they are.